Riyadh, Oct.10 (BNA): Gulf Cooperation Council (GCC) Secretary-General Dr. Abdullatif bin Rashid Alzayani has today held a meeting with UK Defence Senior Adviser for the Middle East Lieutenant General Sir John Lorimer and the accompanying delegation. The two sides reviewed deep-rooted historic friendship and cooperation, between the GCC states and the UK, within the joint strategic partnership and of further bolstering defence and military cooperation. The meeting, which was held at the GCC General-Secretariat in Riyadh, Saudi Arabia, focused on latest political and security developments and other issues of mutual interest. Lieutenant General Sir John Lorimer presented to Dr. Alzayani the medal of the Royal Military Academy Sandhurst (RMAS), from which he graduated in 1973. 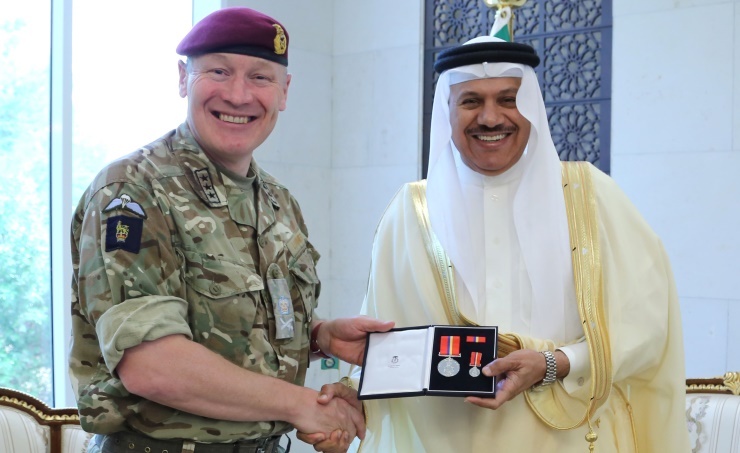 The GCC Chief extended appreciation to RMAS high management on the initiative, hailing the standing and high reputation of the UK military institution. The meeting was attended by the UK Ambassador to the Kingdom of Saudi Arabia Simon Collis and Military Attaché Brigadier David Russell Parsons'.